Here are selected WordPress web design and development projects completed by Ant Tyler’s Adur Design, click the images to view the website designs. Do you want a new, user friendly, responsive, mobile friendly website? Get a quote for a professional, affordable modern website. 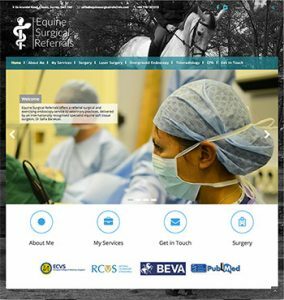 Adur Design has just launched a bespoke WordPress website for Equine Surgical Referrals. 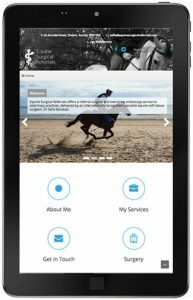 This new mobile friendly website showcases the services of Safia who is a UK based equine surgical specialist and includes user interactive features for client enquiries. Strong, unique images are used throughout this clean and clear, modern website which uses a responsive, custom WordPress theme. WordPress training was provided on this website’s launch phase so that the website owner can login and edit the website’s page content to ensure the latest information is available for future clients. Ant Tyler’s Adur Design completed this project on time and to budget with project enhancements catered for along the way. If you have a new website project or an older website that you would like re-designed and bought into a modern content management system such as WordPress get in touch to find out more. 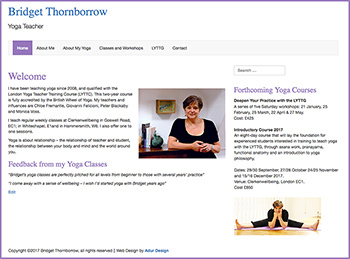 Adur Design has recently launched a custom built WordPress website for Bridget Thornborrow Yoga. 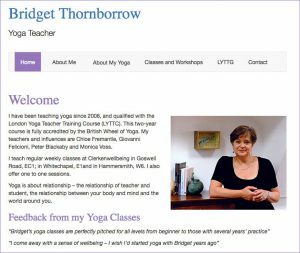 We designed this website and built it from scratch to develop a clean and clear responsive website which show cases Bridget’s yoga work. This WordPress website is designed to be viewed on mobile and tablet devices for a positive user experience, Bridget’s new website also features info on yoga classes and contact form. Ant Tyler’s Adur Design completed this project on time and to budget with jargon free support along the way. Bridget’s new website replaces an older website and the website project allowed for a design refresh to refresh Bridget’s web presence. Bridget can also edit her own page content and upload images as required to keep this new website up to date. We also helped Bridget get started with her new website with WordPress training. Find out more about this project and how we can help you with a new website or refreshing an old website to a responsive, new website get in touch for a chat. 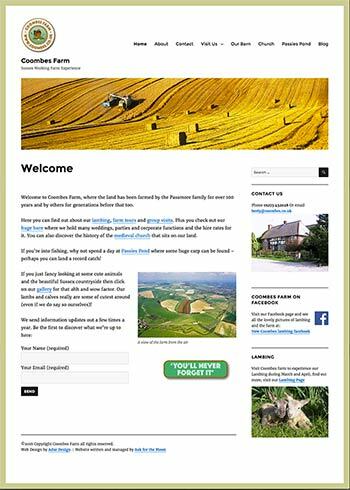 A recent website launch by Adur Design was for Coombes Farm in Sussex. This new clean and clear WordPress website replaces an old website that needed a design refresh. 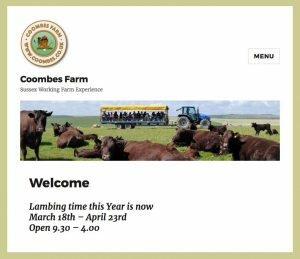 We built this website from concept to launch with supplied copy to improve the Coombes Farm brand. This new WordPress website is mobile friendly using responsive web design for mobile, tablet and multi device use. 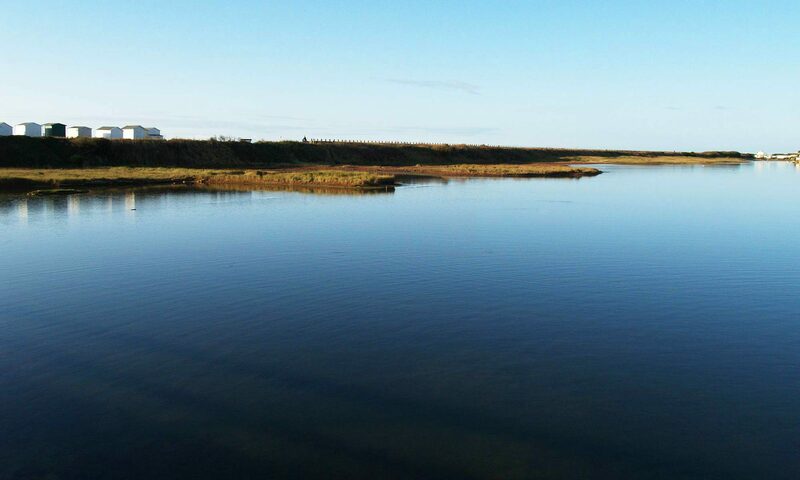 The Coombes Farm staff are now able to add their own blog posts for their latest news and edit their own page content as they need to. Find out how we can help with your new website project, visit our contact page to get in touch. Adur Design built and launched Pete Blackaby’s new WordPress website, Pete is a Brighton based Yoga Teacher and author. This new, clean and clean responsive website uses WordPress’s mobile first technology for use on multiple mobile devices. We provided clear client liaison and support working with Pete to gather requirements and producing a user interface design which went on to a prototype website build. We developed content and website features that ensures Pete’s new website meets his users needs. We are proud to say that this WordPress website project was completed on time and to budget with helpful, jargon free support. 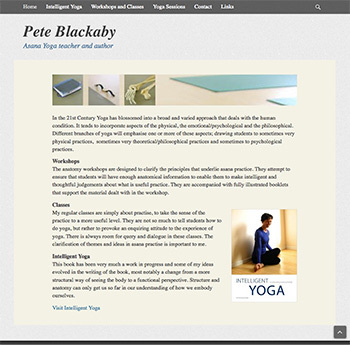 Pete Blackaby’s new website show cases his work with Asana Yoga and his books on Yoga practice. 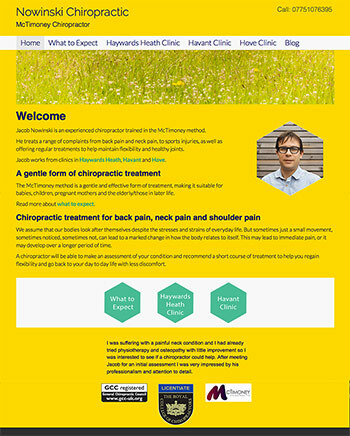 Pete’s yoga sessions can also be viewed and booked online through this website. Pete is able to log in and edit his content by using the user friendly WordPress content management system to keep his own website up to date. Find out more about moving to your website to WordPress or how your website can be mobile friendly. Call 07732 614914 for a quote or you can also visit our contact page. 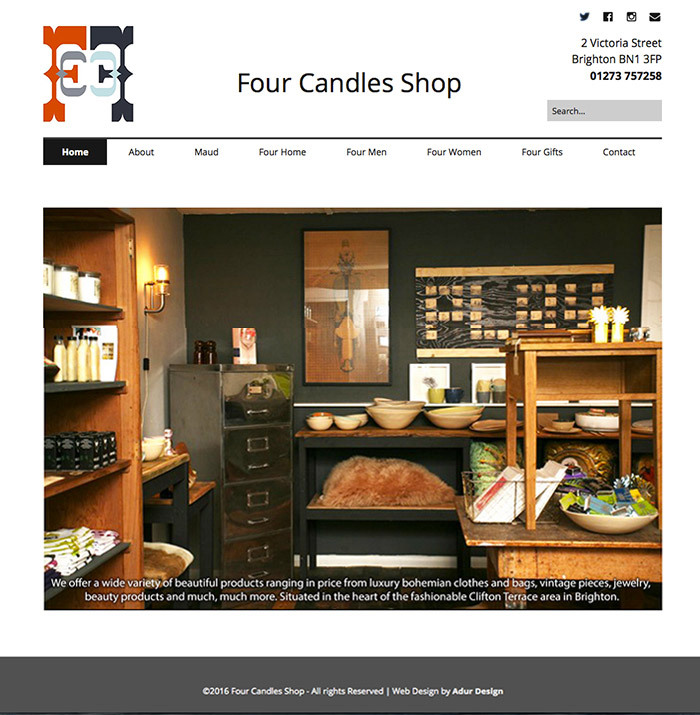 A recent Adur Design website launch was for the Brighton based Four Candles Shop. This clean and clear, mobile friendly website showcases the unique and colourful products for this individual Sussex boutique. This WordPress website was designed and built from scratch using original branding and launched to deadline and budget by Adur Design. 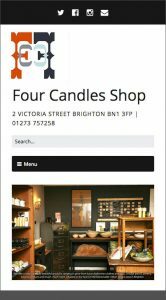 The Four Candles Shop website can expand as the business grows as this website is built on the flexible WordPress platform which allows extra functionality and easy uploading of new stock and products as required. 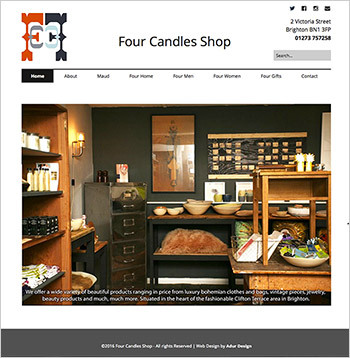 The Four Candles Shop website also features a custom email sign up function that allows visitors to sign up to get the latest news from the Four Candles Shop. If you would like to know how we can help you get your business online and selling your products or if you need an online shop solution call: 07732 614914. Or get in touch via our contact page. 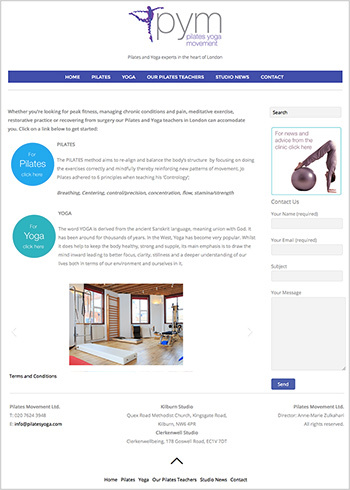 Adur Design’s WordPress website for Pilates Yoga Movement (London) was produced from concept to launch using the flexible WordPress platform. This is a clean and clear, mobile friendly website training website which was designed and built from scratch using the PYM Training brand and launched to deadline and budget. The PYM Training website supports students with their studies with a login feature for students to access online course material. Interactive features include: course calendar, document downloads, latest course news (blog) and contact form. PYM Training was built on the flexible WordPress platform which will allow this website to grow and to be customised and adapted further as the PYM training course and business grows. We are always happy to discuss your latest website project, if you have an old website that you would like to move to WordPress with a design refresh Adur Design can help you. Find out more about our web design and development services and how we can help with your new website project. Call us on 07732 614914 or get in touch with our contact page. 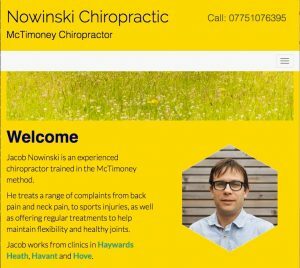 Adur Design’s WordPress web design and build project for Nowinski Chiropractic was design and built producing an information portal for Jacob Nowinski who offers chiropractic services in the Sussex area. 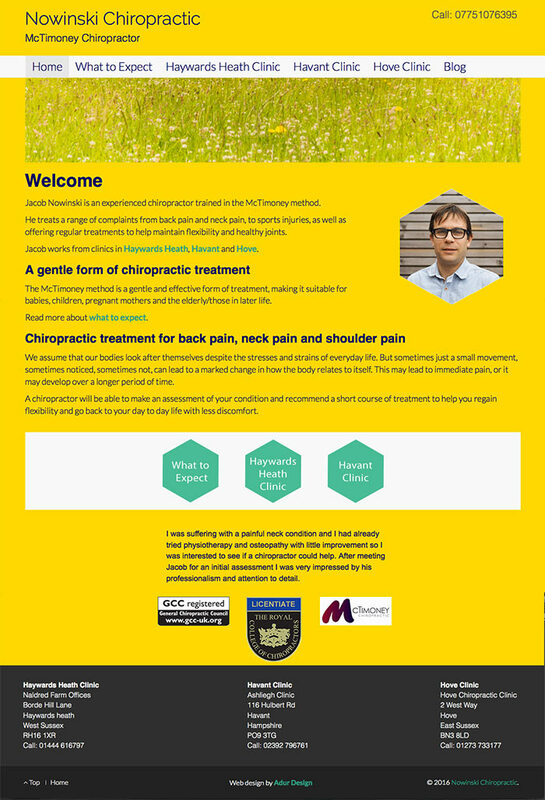 Nowinski Chiropractic is built using mobile first technology for a responsive, mobile friendly design for a multi device user experience. This site adapts to the mobile device that it is viewed on and also responds to larger screens as required. We would be happy to discuss your latest website project, if you have an old website that needs a refresh or would like a website designed just for you and your business Adur Design can help! Would you like to find out more about our web design and development services? Call us on 07732 614914. You can also get in touch with our contact page. 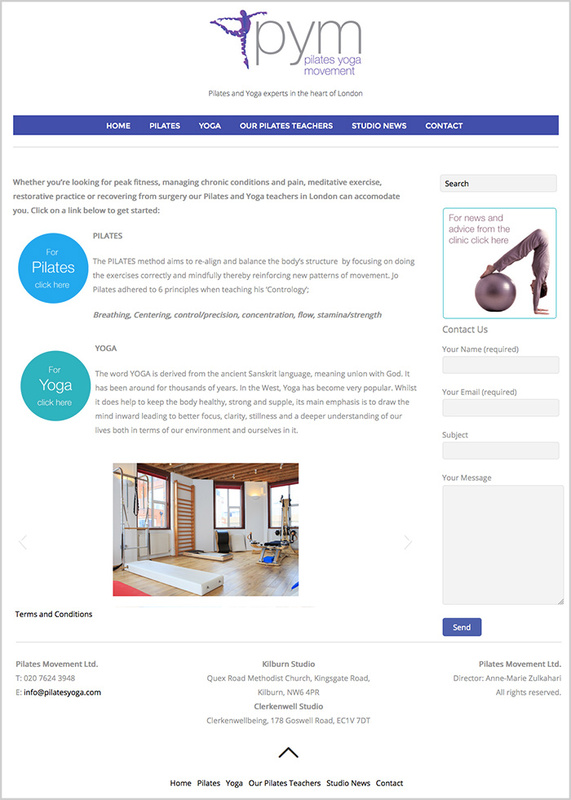 The new Pilates Yoga Movement London website by Adur Design, this WordPress website was re-designed and developed to include a responsive design that is mobile and tablet ready by Ant Tyler. 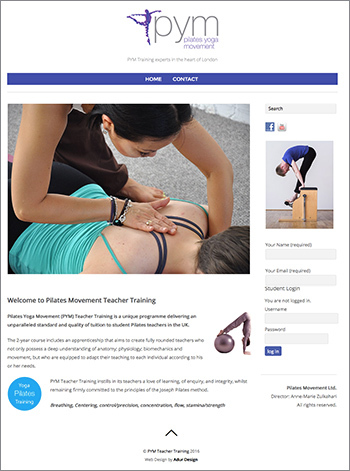 This WordPress website re-design project bought a fresh look and feel to the PYM brand which hold yoga and pilates sessions in Kilburn and Clerkenwell, London. This website project was also completed to deadline and budget with clear communication throughout. 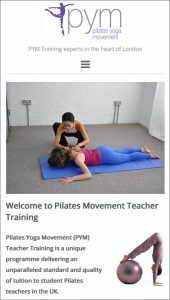 The new PYM website is built on the WordPress website platform which allows PYM staff to edit content and create blog posts to bring you the latest pilates and yoga news. The LYTTG (London Yoga Teacher Training Group) website project was completed and launched by Adur Design. This clean and clear Yoga portal has a responsive front end design for use with mobile devices and tablets. This new Lyttg website allows registered users to login and view content only available to LYTTG members. Further WordPress features include an events calendar, video content, reference document section, training session information and latest news posts. This website project was carried out to budget and includes routine WordPress maintenance and support as part of the website aftercare. If you would like to find out more about this web design and development project or you want to start your WordPress web project call: 07732 614914 or just get in touch through the contact page. 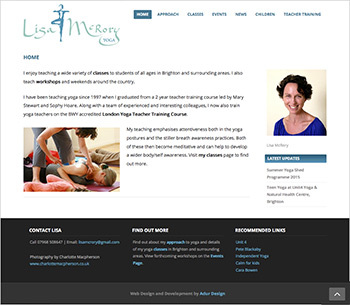 Adur Design designed, developed and produced a new WordPress website for Lisa McRory Yoga. 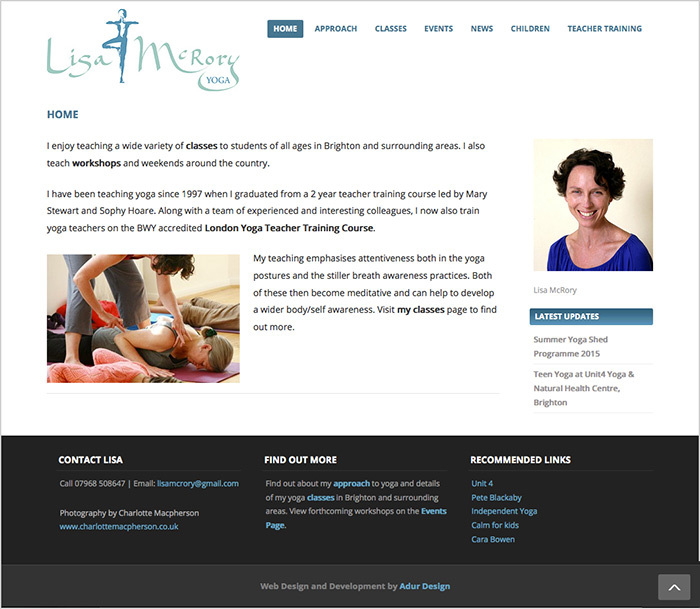 This informative website show cases Lisa McRory’s unique approach to her yoga practice with a clean and clear responsive WordPress website. Also featured is an events calendar for users to see the latest yoga classes and workshops with venue information and further details. A blog feature is used as a latest news and updates page which is quick and easy to edit and publish by Lisa. This new website is built on the very flexible WordPress platform to allow further expansion with website features in the future as required as Lisa’s business grows. Adur Design produced, designed, developed and launched a new website for Sujo Remi on the flexible WordPress platform. 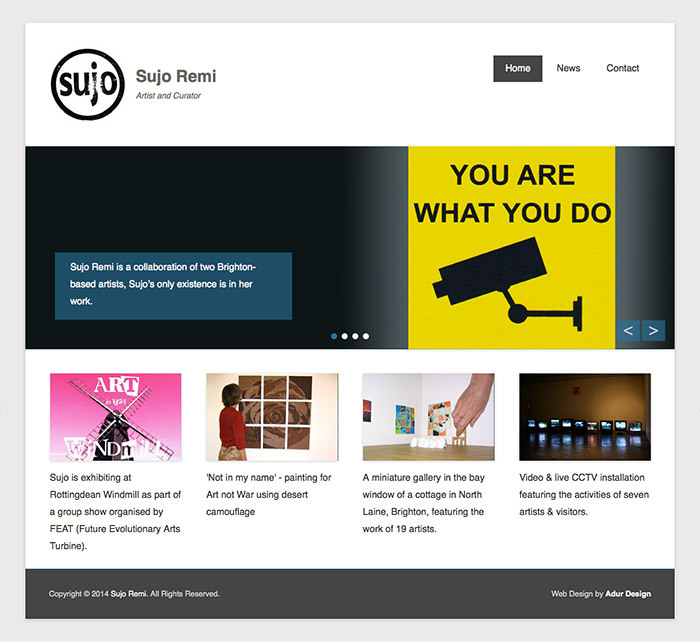 Brighton based artist Sujo Remi required a modern, mobile friendly, website to showcase art work, we designed and developed this WordPress website which can be built on and added to in the future. 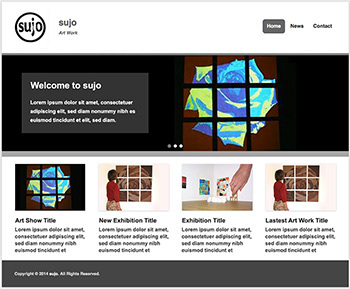 The Sujo Remi website has a blog feature so the latest news, art work and images can be easily uploaded for online promotion. This WordPress website was designed, developed and launched by Ant Tyler and included WordPress training to enable website owner content management. I needed an online presence to showcase recent work and projects but only had basic knowledge about building websites. Ant Tyler at Adur Design produced a spot on web design for my art practice which he build into a WordPress website. The website was launched on time for our exhibition and I can now login and edit the page content and also post blogs for my news page. Ant was very efficient and good to work with and he was with me every step of the way. I’m happy that I used Adur Design for my wordpress website, thank you Ant! We design websites to fit your needs and to suit your requirements, view our web design packages. You can find more details about our service on our web design page. Feel free to call 07732 614914 to discuss the above projects or to talk about your new website or use our contact page to get in touch.